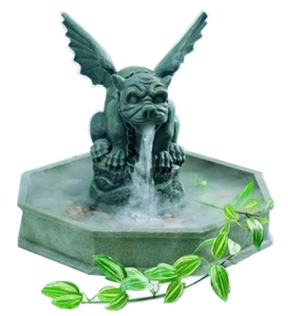 The Gargoyle Mist is a truly unique misting fountain. This tabletop model is a convenient size, so it will fit almost anywhere. Use it to enhance your home or office with the relaxing sound of running water. This fountain is not only relaxing to listen to, but it also looks cool too. It is an indoor water feature that features a gargoyle in the center. A gray stone-like finish gives this fountain an authentic look. It is so easy to use, and it generates negative ions, so it is actually good for your health too. Just turn it on and a combination of water and mist flow from the mouth of the little creature. A natural cloud of mist will form over the entire basin as the water continually circulates itself. This amazing fountain comes with a pump and misting device and everything else you need. Enhance your home or office. The Gargoyle Mist generates fog and mist by utilizing electrical oscillation technology. The ceramic disc in the misting unit vibrates under high frequency to generate negative ions and a natural fog on the top of the water. There are no chemicals or dry ice involved. Just simple tap water is all you need to enjoy the benefits of this amazing misting fountain. A water pump draws water up and pumps it out the mouth of the gargoyle. Just fill it up and turn it on. That's all there is to operating this unique little fountain. Great for giving as a gift. The Gargoyle Mist is perfect for children college students, dad, brother or anyone else that would enjoy a truly unique and beneficial decoration for the home or office. This fountain not only looks good, but it is beneficial to your health and well being too. The Gargoyle Mist is a natural humidifier, and the moisture created can help people with allergies or respiratory problems, feed plants, add moisture to your skin and more. The negative ions generated are also helpful for purifying the air. With the addition of just a few drops of oil, it becomes the best aromatherapy diffuser ever. Order Yours Today. Dimensions (l x w x h) 17.5" x 16.5" x 14"
The Gargoyle Mist includes a misting device and water pump. Water and mist flow freely from it's mouth and into the basin below. Perfect size to put almost anywhere. Order Yours Today! I sent this to my niece in vegas as a house warming gift. she was so excited! she immediately opened the box,hooked it up, called me and said "this is the coolest fountain ever!" the cat likes to drink out of it too! I need directions for setting up the gargoyle mist?. This is the 2nd bought but I can't find the directions. Please e-mail me the directions, I still want to deal w/ your company. Give us a quick call. We would be happy to help you set it up. I have the fountain.. need a replacement pump with red light.. Ya got one? We should be able to help you out. Just give us a call.